Before I went to 4-H quilt camp, my June OMG was completed and gifted. 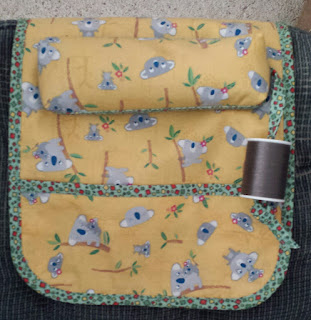 Yes, I know, I said it was for me but the fabric with koala bears was sitting there begging me to be made up and I obliged. The only regret I have with the project is that I didn't use more fabrics to make the project sparkle. 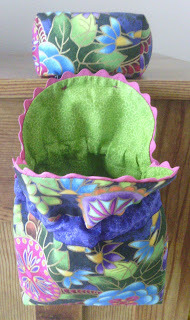 If I were to do it again, I would at least use the pincushion fabrics in reverse with the green print on top. The one change I made was to dangle the thread spool like a bead on the strip that was supposed to hold it on top of the pincushion secured with straight pins. When the spool was on top of the pincushion, it and the pincushion were very wobbly. Eventually, the pins would work their way loose. With a loose knot in the strip, it is easy to change thread colors. 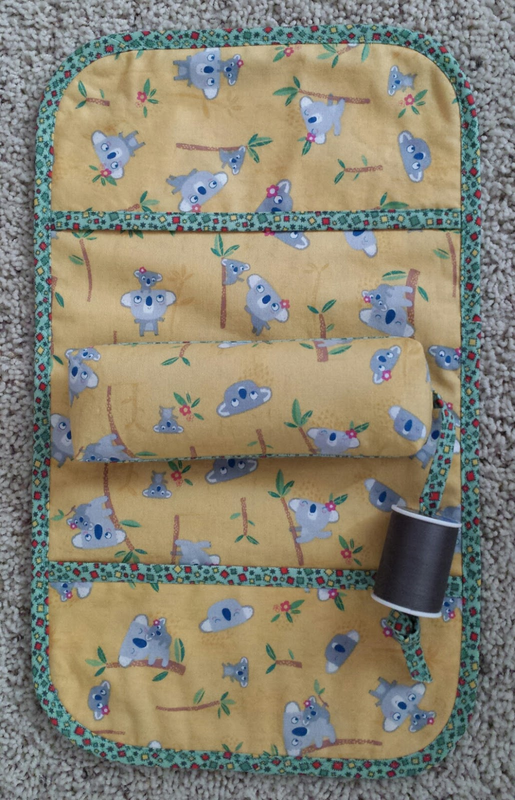 I didn't add any dividers to the pockets. They can easily hold a pair of small scissors or reading glasses. The recipient loves it and it replaces an earlier armrest sewing station that I made a few years ago and was used so much it is worn out. My friend does much hand stitching on the arts and crafts see sells in shows around the Northwest. I have a sewing station on my extra long to-do list! Your's looks very nice! Congrats on the June finish! What a lovely and useful item. Thanks for linking up with Elm Street Quilts One Monthly Goal and congrats on your finish. A friend made me one of those, a couple of years ago. 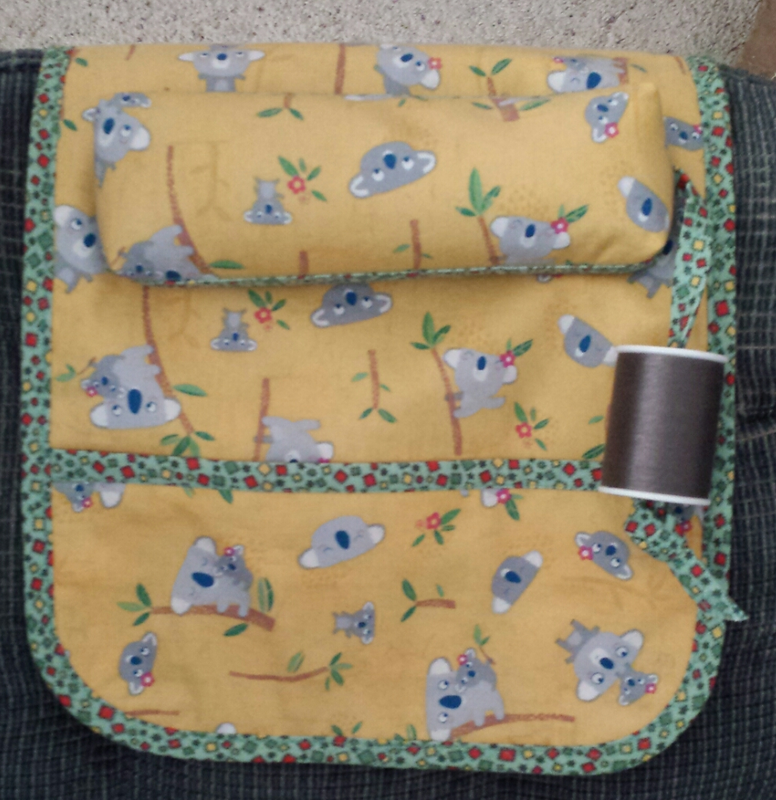 Handy, but, most of my stitching is done in chairs that don't have arms, so, it doesn't get used very much. It is really lovely Sally, think I made need to make something like that for my armchair. Cheryl, if you sit next to a table, this one might serve double duty at the machine, as well: http://www.sewmamasew.com/2009/03/elizabeths-fabric-focus-3/ I want to make this one for the embroidery machine.